Listen in on Presidents Lyndon Johnson and richard Nixon behind the scenes of the Viet Nam war.Hear intimate discussions and controversial decisions that set history in motion. 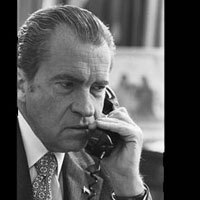 LBJ Phones Friend, Sen. Richard Russell. May 27, 1964, Johnson called his trusted friend Senator Richard Russell, a Georgia Democrat and chair of the Senate Armed Services Committee. Johnson counseled Vice President Hubert Humphrey on how to disarm potential opponents to the Senate bill. Nixon coached Ambassador to Germany Ken Rush on how to defend the counter-offensive during an appearance on a morning talk show. Nixon warned Thomas Moorer, Chairman of the Joint Chiefs of Staff, that the military had no excuse for failure.